It’s been a good month for guild progression. After kind of a lull in 25-man progression, we are coming into our stride and downing bosses at a good place. Having a fairly consistent team of raiders helps immensely. I spent a fortune chanting and gemming my new tanking gear and my healing set. I replaced half of it within the past month or so but never bothered gemming or chanting it properly. Oh, Zul’Aman is finally on clear; we blasted through the entire instance last Wednesday and got our first full clear. Zul’jin died on the 3rd try (2% on the first attempt lol). In the middle of phase 3 we collectively realized that no one knew what the hell to do for phases 4 and 5. So there we were mid-fight, fast as hell googling strats and reading off of WoWWiki on vent, LOL. I got the Battleworn Tuskguard off of Malacrass to replace my Tier-4 helm and another 2-hander toy off of ZJ to play with/dump in the bank. We were a couple minutes off from making the 3rd chest, close! The HMgT tanking trinket apparently only drops when I am not in the run /boo. 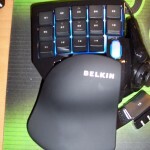 Earlier this year Belkin released the n52te, an updated version of the n52 gaming keypad that I wrote about last year. I caved in and bought it recently. The n52 is comfortable because it has an ergonomically designed hand rest (if you have the n52te, it’s coated in rubber). Out of all the gamepads that I’ve tried, the n52 was the only comfortable peripheral, in my opinion at least. The keys on the n52te are a huge improvement. One of my only gripes about the original device was that the keys, especially the circular button, were very stiff and took quite a bit of time to break in. The new buttons are way more responsive. They are soft and quiet, I’d say somewhere between laptop keys and normal soft keys “feel wise. The scroll wheel was also significantly loosened up so that it feels more akin to a normal mouse wheel. 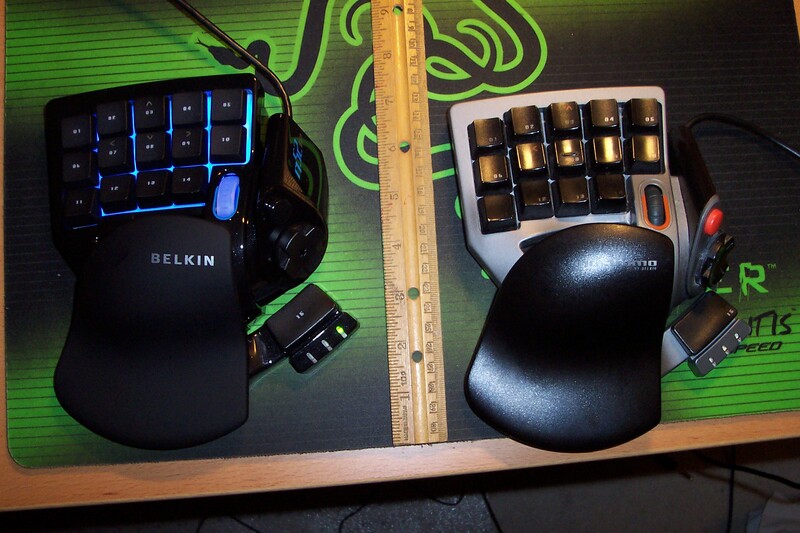 I own a Razer Diamondback, it feels pretty similar in terms of click and looseness. The dpad on the n52te comes with a “joystick” on it, kind of similar to the ones on the Playstation Dual Shock controllers. It’s made of plastic and doesn’t grip your thumb sufficiently. It is however, easily removable if you do not like it. I don’t know why Belkin/Razer chose do to this, but the null shift state was eliminated. Consequently, that is one less set of keys that you are able to bind. 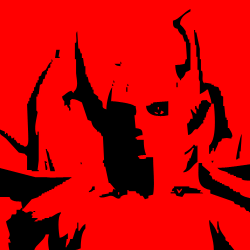 So if you use all 4 (null, green, red and blue), you are kind of SoL. Rumor is that the null state might be re-added in a future driver update. 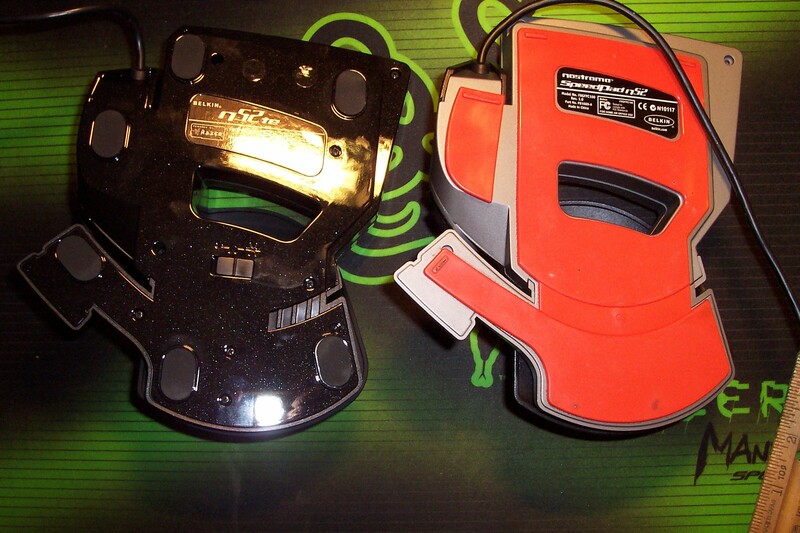 The orange rubbery non-slip pad has been replaced by 6 rubbery feet, which grip better. The orange pad though adequate, still slid a bit, especially when my desk was dirty. Earlier n52te models had problems with the pads being uneven and rocking. 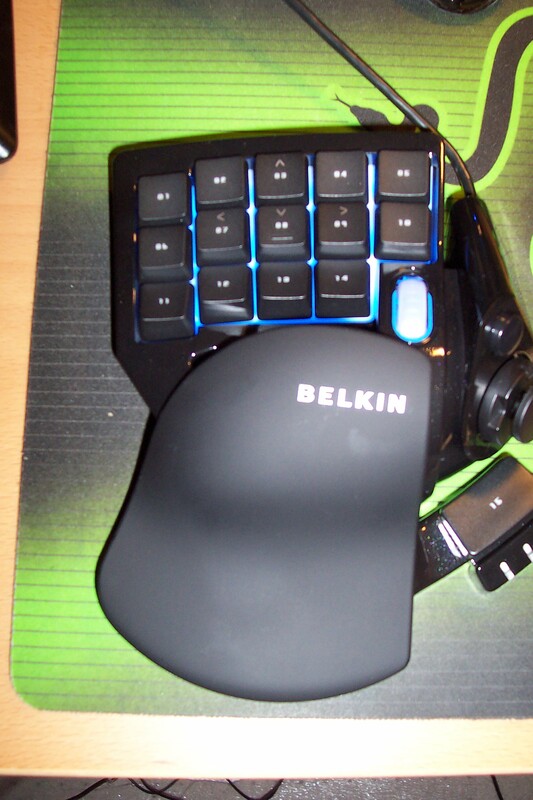 Belkin seems to have resolved the issue since my gamepad is fine. To be honest, the $70 price tag for the Tournament Edition is a bit much (the new keys really really do feel much nicer though…and it matches my keyboard and mouse lol). If you already own an n52, it’s not a huge upgrade. If you don’t own one, if you can get past the learning curve it is an invaluable gaming tool. Highly recommended! It was also suggested to bind all of your most commonly used spells to non printing keys. The LED backlight can be toggled on and off with a switch on the bottom of the pad. The Sunwell badge loot vendor popped at around 8am this morning on my server. I really did try hard to find a valid reason why I couldn’t go to work but alas, I’ll have to wait until this evening in order to cash in. I have all of my gems and leg armor materials ready to craft and cut. It’s a reasonably good idea to buy any chanting and gemming materials that you need before the vendor on your server pops, since there is a high chance that prices will skyrocket. I do though, need to find someone who can craft a Solid Empyrean Sapphire, won it off of Magtheridon this weekend. I very heavily regret prematurely socketting my ZA +15 stamina quest gem. Why didn’t I save it? The extra defense is nice because I’m barely sitting at 490 now. I’ll probably replace 150 health with the new +15 def chest enchant. If I find that I am avoiding attacks to the extreme detriment of threat in the easier raid instances, I can swap out pieces. Defense isn’t useless past 490; I think I might have stated that somewhere months ago. Oh, none of the shields that I want will drop. Neither will that new trinket…/cursed.